Joe Bowman was a long time parishioner at the Church of the Epiphany. 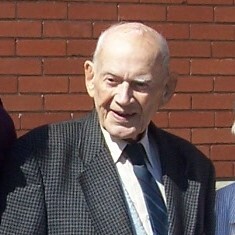 He was known in the area as the Mayor of Manor Park. He owned a Variety Store on the corner of Wharncliffe Rd and Emery St. Joe was a very generous man. If someone needed food, but couldn’t afford to pay just then – no problem. Joe would give him what he needed. In reality Joe was the first food bank in the area, long before our church food bank. Joe was also a decorated war veteran. He was instrumental in forming the Manor and Highland Park War Restoration Committee when the cenotaph was vandalized beyond repair and had to be replaced. Back in 2011 Adam, Teresa’s son Adam interviewed Joe for a school project. Here is an audio file of that interview. Ron, November 14, 2018. Category: Gone but not forgotten.